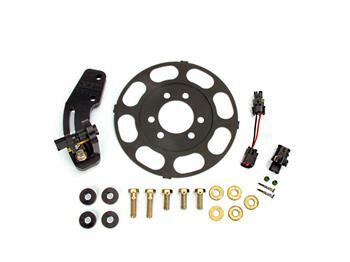 FAST Ignition Crank Trigger - Dezod Motorsports Inc - Home of the automotive performance enthusiast since 2002. Engineers at FAST turned to the OEMs to see what they trust in the way of rpm-measuring crank triggers for their 400 and 500 horsepower daily drivers. Until now, flying magnetic trigger wheels with bulky inductive pickups have been used with the risk of broken magnets or losing magnets at high engine rpm. Now FAST has a better answer. A magnet-free device, this new piece from FAST includes a wheel constructed from ASTM A36 grade steel that is so strong that it only needs to be .125” thick and is virtually indestructible. With the wheel being this thin, it not only weighs less but requires less space than competitors’ aluminum versions. And the FAST inductive sensor is also much smaller than others on the market and is hermetically sealed with the connector molded into the body. The key to the crank trigger’s dependability and accuracy lies in the trigger wheel design. Rather than having added magnets, the wheel has tabs on the outer rim. These tabs are measured by the inductive sensor as the wheel revolves, which then provides data to the fuel injection and ignition systems for accurate rpm measurement. And because the tabs are a part of the single wheel unit, there is no possibility of loss or fragmentation as with the magnetic style trigger wheels. This sensor is used by OEMs both on and inside the engine and provides long-lasting, accurate timing. Installation is straight forward, and everything required is included. For those already using the FAST XFI system, it’s a plug and play unit. In addition, it’s compatible with many other EFI systems on the market.